We’re back from our camping adventures! Hooray! Despite the crazy British weather (where you can have 4 seasons in 1 day) we had a great time. I’ll post some of our highlights soon, meanwhile I thought I’d share with you our Camping Survival Kit A-Z. 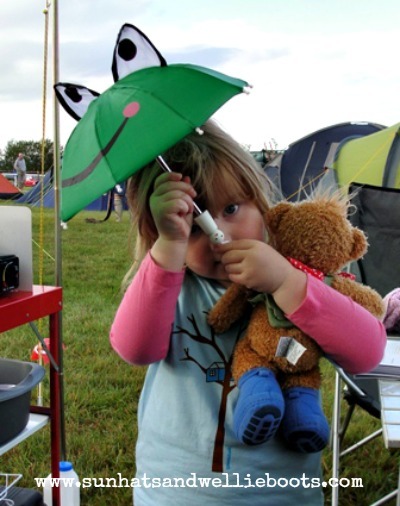 It's a selection of things that helped keep us sane while camping with a 3 year old. A – Activity Packs. Here's how we created our own. B – Bin bags. Not the most chic thing to pack, but they are mighty useful. Great for storing clothes/blankets to prevent them from getting damp, storing dirty washing, protecting items when packing up, or storing wet wellies/shoes when travelling. We find extra plastic bags are useful too just in case someone feels unwell. E – Emergency (ICE) wristbands. ID wristbands are a way of attaching your contact details to your child. Heaven forbid they are ever needed, but if they were this wristband provides emergency information straight away. F – First Aid Kit (travel pack size) with relevant medication, bandages/plasters etc, anti-histamines, & insect repellent for those meddling mozzies. We also take sachets of Calpol, & tubes of Tea Tree cream, Arnica cream (Nelsons do a great range of homeopathic remedies). G – Games & toys. Minnie took a few of her cuddly toys with her on her camping adventure; great for providing familiarity, comfort & security. Also fab for imaginative play! We chose to take simple indoor games which didn’t take up too much space, along with bats & balls for outdoor play. H – Huggalugs are something I love! I invested in a pair when Minnie started crawling & they were great for protecting her knees as well as keeping her legs warm. Since then I’ve bought another couple of pairs which she wears on her arms & legs. They’re perfect for providing extra warmth without creating bulky layers & can be added or removed quickly, ideal when they need to be removed from a sleeping child! As it was so cold in our tent at night Minnie wore her Huggalugs on her wrists & over her hands which kept her nice & toasty in her sleeping bag. I – Illuminations! We leave a large battery operated torch in the tent, & keep handheld wind-up torches in our backpacks. Minnie was keen to have her own this year so we gave her a small wind-up one. 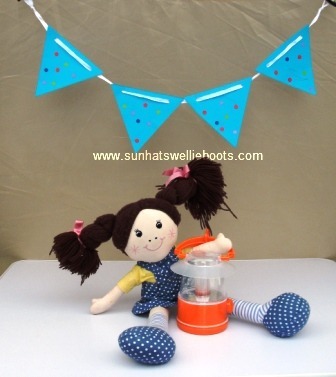 It was great to see her independently winding it up & the excitement on her face when it produced light was a picture! We also took some small battery operated lanterns which produced a subtle light to help restless sleepers. K – Knitted hat! Well a fleecy hat would be ideal too, just useful when the temperature drops at night. I popped a hat on Minnie as she was sleeping just to help keep her warm. So much body heat is lost through your head it makes sense to wrap it up. L – Loads of books! 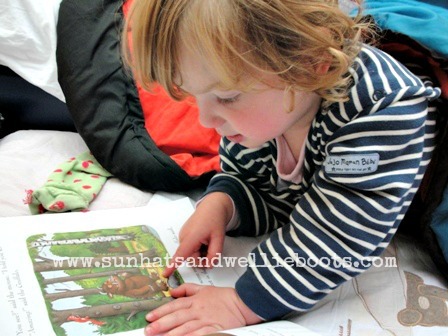 :-) We love to read anytime, anyplace, anywhere! Paperbacks can normally fit into a bag & others can be left to enjoy in the tent. You may have to limit the amount taken though, my little bookworm was keen to take her entire library! 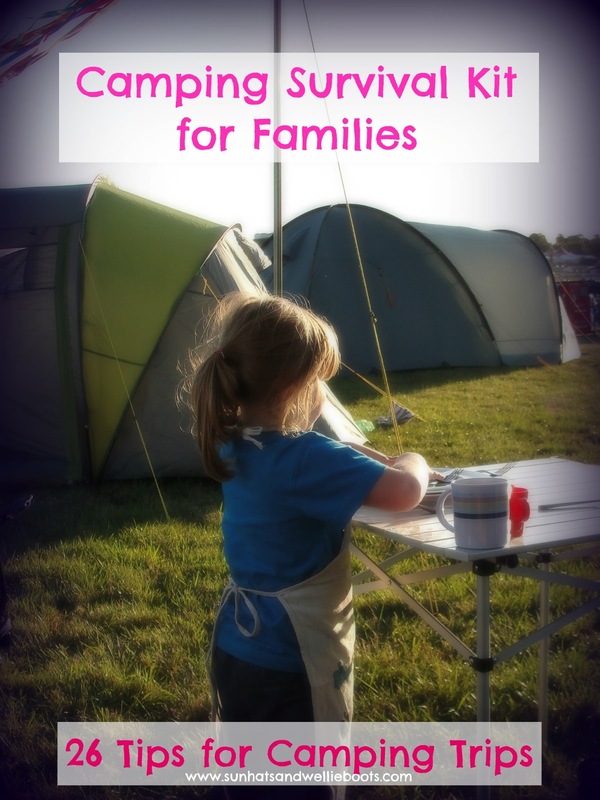 Here are some of our fave camping books. M – Mat or inflatable mattress. We’ve found that inflatable mattresses are the best way to keep warm & comfortable at night. You just need to remember the foot pump. ;-) This year we borrowed an inflatable bed from a friend for Minnie. It worked really well, kept her safe & snug, & the padded sides prevented her from rolling around. We used a sleeping bag & blankets with it as it was so cold, but it would make a great spare bed at home as it is. O - Organisation. With just a little of the stuff a camping trip is so much easier. P – Portable potty! We’ve taken this travel potty in the past, & although Minnie doesn't use it regularly any more, it was very handy for her at night. Q – Quilts & blankets. For providing layers of warmth on chilly nights inside the tent, or wrapping around you when star gazing! Great for play mats during the day too! 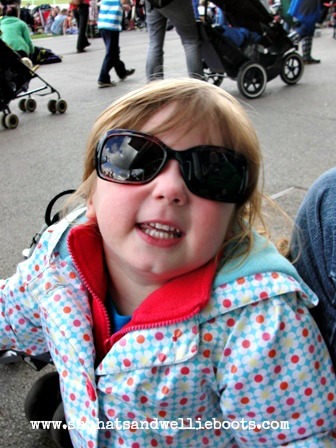 S – Sunhats, Sun cream & Sunnies! T – Tubs! We used flexible storage tubs like these which were great to pack equipment in & squashed easily into position in the ever so slightly full car! Once emptied they became washing bowls, one for plates/cutlery etc, & one which we used as a mini bath for Minnie. The handles made it easy to carry when filled with water. I've recently seen these folding bowls too, very handy for saving on storage space! 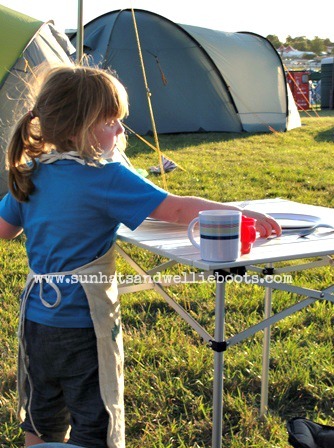 U – Unfolding camping table & chairs. V – Vacuum/Thermos flask. These became really useful. We filled them with hot water at night ready to use for washing the next morning. Ideal for impatient pre-schoolers who have to be up & ready first thing in the morning. W – Wellie Boots! Of course! Along with warm clothes & waterproofs... especially if you live in the UK! 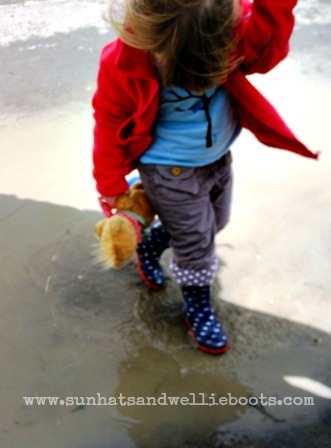 As you can see my little Peppa Pig fan just can't resist a muddy puddle or two! X - eXtra items! Ok I cheated! ;-) Extra warm clothes, waterproofs & towels are always useful for those 'just in case' moments. Towels can become extra blankets, or mops in an emergency, they can be rolled up as extra pillows, or used as mats for washing bowls etc. Extra batteries/matches/toilet rolls are also handy. Y – Yummy handy snack packs. Whether packed in small tubs, or bought in mini bags, healthy snacks help keep tired toddlers happy & keep tired parents sane! Some of our favourites are dried fruits, & the Goodies range from Organix. They've recently introduced mini packs which are ideal when traveling & full of natural goodness too! I'm sure you'll have many more to add to the list & can think of 101 other things which help make camping just that little bit easier. If you have any top tips to share please leave a comment below, I'd love to hear them.